The Celestron 81000 is a camouflage backpack for storing optics, camera equipment and other gear for your outdoor excursion. Its sturdy design stands up to harsh treatment on camping or backpacking excursions. This backpack has large main compartment and six zippered accessory pockets that provide ample space for storing all equipments you need. The PALS-compatible webbing accepts external pouches and other gear to conserve space inside. Also the padded shoulder straps, adjustable waist and chest straps provide a custom fit and distribute weight over more of the body. The Celestron Backpack, Camouflage has many exciting features for users of all types. You can extend the lifetime of your Celestron Backpack, Camouflage with the purchase of a FactoryOutletStore Factory Protection Plan. 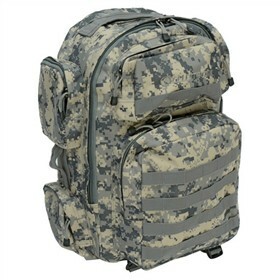 See the Celestron Backpack, Camouflage gallery images above for more product views. FactoryOutletStore stocks a full line of accessories like Celestron Field Guide to Birds of North America, Celestron LensPen - Optics Cleaning Tool, and Firecel Portable Charger / Light for the Celestron Backpack, Camouflage. The Celestron Backpack, Camouflage is sold as a Brand New Unopened Item.